Newton's Nook Designs: Sneak Peeks for March Release! This is our second post for today - to see Inky Paws #7 - Go Green Challenge winners, scroll down or click here. 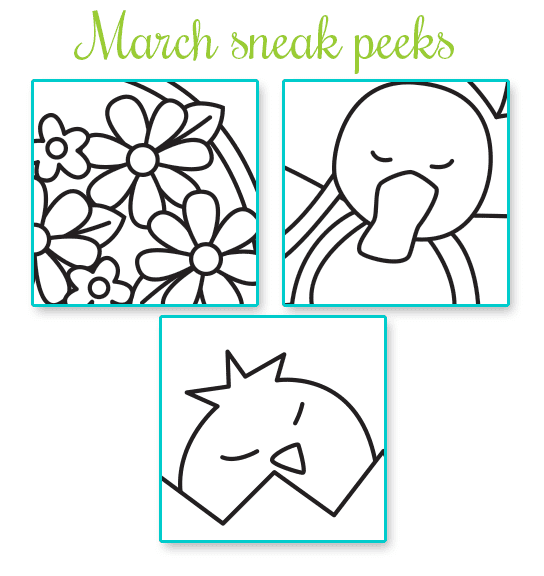 Just a quick extra post today to give you sneak peeks of the three new sets for March. This week we will be featuring previews of these Three new sets - Tuesday through Thursday we will have one full reveal each day with some really cute cards made by our Design Team and Guest Designers! All three sets will be for sale in the online shop on Friday, March 21st! It's going to be such a fun week! Any guesses as to what these sets will contain? Hint: Spring is just around the corner! Ohhh these looks so cute!!! Can't wait!!! Oh these look so spring-ish! I'm hoping that's a basket full of flowers and Newton! And is that a cute, little duck? Can't wait to see what the DT and guests come up with! Oh my...I'm seeing "peeps" of spring about to be revealed...yayyyy!! !